In this article, we will learn the reason to have hidden variables into our web applications. Also we will see the process to access hidden variables into Struts Web Applications. So, Struts provides a tag library that holds a set of tags. 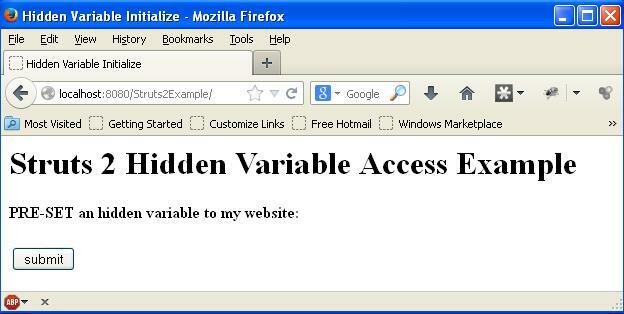 A tag <s:hidden> out of this set is used to set up a hidden variable into the web page. This variable is accessed using the setter() and getter() methods of the action class variables. An action class need to have the same class variable name with its getter() and setter() methods, those are used to define into the html form attributes. Listing 1 defines a webpage that setup a hidden variable “myUrl” using struts tag library tag <s:hidden> with value attribute “https://www.umesh.asia” . One more attribute “Submit” button is defined using the tag <s:submit> with label “Submit”. These two attributes are enclosed using the html form. This form is defined using the struts tag library tag <s:form> that defines an action attribute to “helloHidden” with its namespace “/”. Listing 3 defines a jsp file “getHiddenValue.jsp” file displays the value of the hidden variable with the single scripted line. The hidden variable value is being accessed using <s:property> tag, where attribute “value” access the value of the hidden variable or the variables defined into an action class. Listing 4 defines a two <action> tags “setHidden” and “getHidden” into <package> tag. “setHidden” action loads a jsp file “setHiddenValues.jsp” file from “pages” directory and “getHidden” action loads “getHiddenValues.jsp” file from “pages” directory, if the java class “HiddenValueAction” returns success. The tag <default-action-ref> defines the server to load the action name “setHidden” as default action. Listing 5 defines a web.xml, a deployment descriptor xml file. This file manages the web application and transmits all hitting requests from the web server to struts filter dispatcher class “StrutsPrepareAndExecteFilter”. Listing 6 defines a set of tags that declares the information about the artifact that needs to pull from the maven repository and also defines the dependent jar files with its version that will help to deploy and run this application into the web browser. This example is created using Struts 2.3.2 version and Struts 2.3.2 version jar files are required to run this web application. Figure 2 displays the value of the hidden variable that was setup into the setAction.action. In this article, we learn about the need of using hidden variables into the web application and also learn the way of using hidden variables into our web application. This article defines a struts 2 example to access hidden variable defined into the web application.